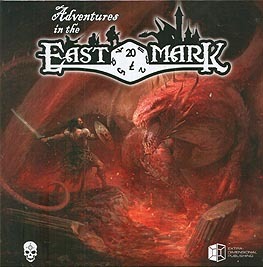 Welcome to the East Mark, young adventurer. I know it was not easy to get here but just consider the rewards: the wondrous treasures, the power and the glory that await you. It will not be easy to accomplish all of them; indeed nothing is easy in the East Mark. You will have to work your way with your sword and your cunning. Ha! I knew you would like that. Here, take the map and the precise instructions so you can survive a world full of adventures. Be prepared to meet legendary characters and battle horrible monsters in dark dungeons or impregnable fortresses. I hope you have what you need. And no, I am not referring to your weapons or your faithful companions, although they will certainly be necessary. I was referring to something more important, something essential: your imagination! Perfect! Now you are ready. Open this box and venture into the East Mark. The glory is inside, what are you waiting for?